Why not dive into the soothing warm waters of a hot tub during the coming Festive and New Year’s season this wintertime? For some, the mere thought of jumping into any form of water during the chillier winter and festive season may not appeal. But wait a minute, what if you could warm up all your families frozen toes, fingers and other extremities, that have become numb from the cold, almost immediately and whenever you want to? With a hot tub just imagine the lovely inviting warm water and all those warm bubbles and jets all coming together to lift your body temperature and your spirit together at the same time! Many hot tub owners, especially in the UK, seem to view them as something to use during warmer weather. However, in the United States, Canada and Scandinavia especially, where colder winters are the norm, diving into the hot to warm up is more of a way of life! For Scandinavians it is often a pleasure to be enjoyed whilst experiencing the great outdoors, perhaps following a Sauna session. For Canadians it is just a way of life for many to jump into the tub, with family and friends alike, all coming together out together in the wilderness! Both those hardy Scandinavians and those brave souls over the pond seem to have realised that, when all around is frozen, and they have become chilled to the bone whilst out and about, there really is nothing quite like diving in! The invigorating feeling of the hot tubs jets and bubbles combined with the invitingly warm soothing water all seem to come together to put a smile on all their faces! So what about in Blighty? We all know the Great British weather can be far from great but wait a minute. Don’t just stay stuck indoors moping about and hoping for the spring to arrive. Try to make the most of what we have got, get out and about and in amongst it! When the snow lays all around, deep and crisp and even, why not get everyone together after a walk outside, and dive right in for winter fun with your family and friends this coming festive season or New Years? In fact, what better way to see the New Year in than to be with your loved ones, together, cocking a snook at all that the British Climate can throw at us as the New Year arrives, celebrate in style! As we have seen, some hot tub owners don’t seem to use their hot tubs when it’s cold outside and choose to winterise them, draining all the water and covering them up instead. If you do want to use your hot tub in winter time, and why not, then there are a few things that you should bear in mind. If your hot tub has seen some heavy use during the summertime then it is likely that things like suntan oils and lotions plus cosmetic products and other residues may still be present. This is why it is good practice to drain the water from your hot tub. Once drained, give it a thorough all-over clean and then refill it straight away with fresh water, well in time prior to the wintertime arriving. It is best to drain and refill your hot tub sooner rather than later because you would not want to be draining it, getting damp and cold into the bargain, when the first snows or frosts do arrive! 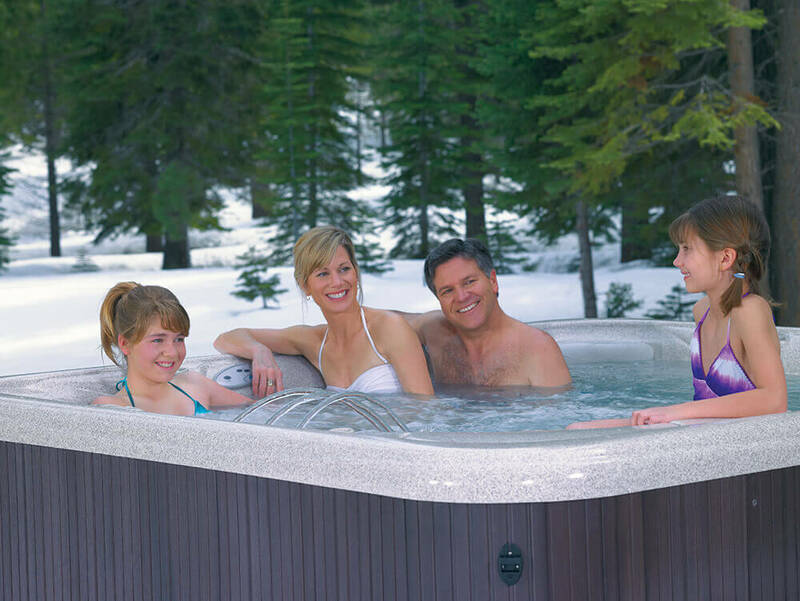 Should there be any tears, gaps or cracks in a hot tub’s seals, then some more heat may escape, taking it longer to come back up to operating temperature. In addition, some contamination from rain, ice or snow melting could also leak into the hot tub which you do not want. To avoid this from happening you should perform a visual check on all of the tubs seals to ensure that they are all in good order. Replace any seals that are not in good condition. The tubs cover is a vital component of your efforts to keep the winter cold out whilst, at the same time, keeping the heat in. If there is any damage that has caused tears, cracks or gaps then you may be losing more valuable heat than normal. You do not want this to happen so make sure that you inspect the cover to see whether it is still in good condition, and buy a replacement hot tub cover if it is not! You should always keep a close eye on the hot tubs water temperature, making sure that it is as you want it, both for your benefit and to cope with the inclement winter climate! To counteract the lower outside winter temperature it may be necessary to turn it up a few degrees or so. Naturally, during winter, cold water can freeze and freezing pipes can cause lasting damage to hot tubs, as they can to any other plumbing system. With their in-built freeze protection systems, hot tubs can easily maintain a more constant water temperature, thus avoiding the temperature dipping anywhere near the freezing point of water! If you simply follow our simple winter hot tub advice and you should be able to have fun using hot tubs all year round and not just during the spring, summer and autumn. Why not invite Father Christmas to drop in too, make sure to leave some mince pies, Sherry and other treats out ready for him!